After sending possibly hundreds of emails in January to various designers and PR companies, I receieved one reply. 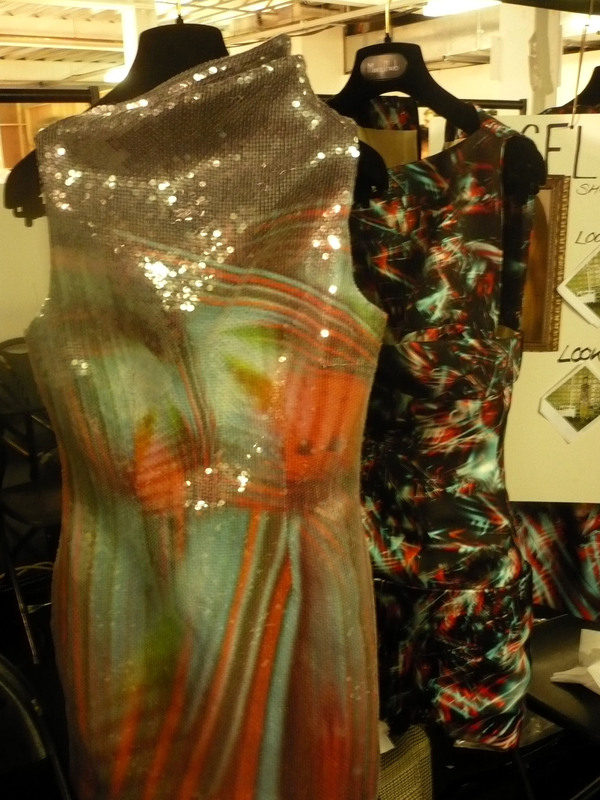 This was my golden ticket into the hungry pit of the fashion world; backstage at Fashion Week. The past 25 years have seen London earn its place as one of the four leading fashion capitals alongside New York, Milan and Paris and is renowned as a platform for young designers and cutting edge style. 25 years ago saw the introduction of visionaries such as Vivienne Westwood, Betty Jackson and Paul Smith. In the 1990’s it was Alexander Mcqueen, John Galliano and Hussien Chalayan who made their first fashion week appearance. There is now a new wave of young designers such as Louise Goldin, Giles, Christopher Kane and Marios Schwab who are keeping London Fashion Week in the forefront of innovation and technology. 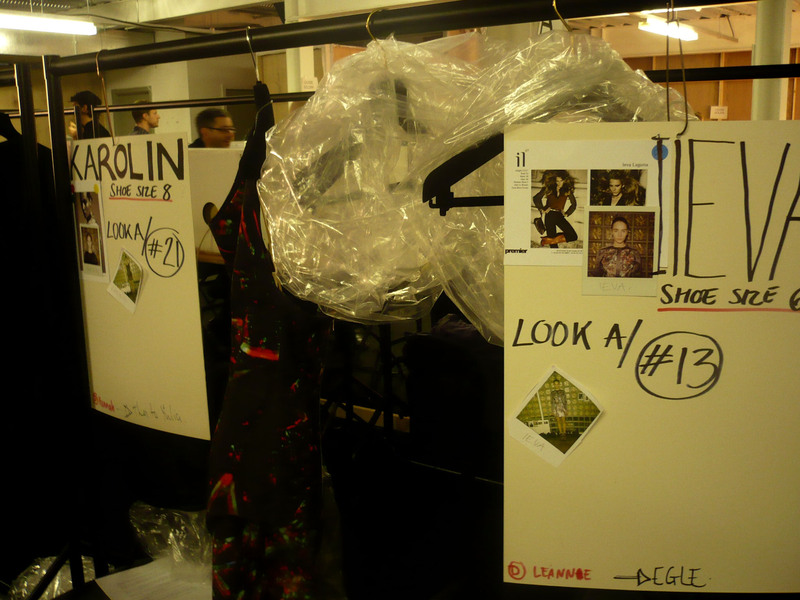 I headed to London to work as a Dresser, literally dressing the models into their catwalk outfits, at the Marios Schwab show. 9:30 – The venue for the show was Westminster University, I signed in at the gate and headed down a ramp into the building. The security guard points me in the direction of the backstage area. Here we go. The backstage area was quite small, about the size of the Chatham canteen. 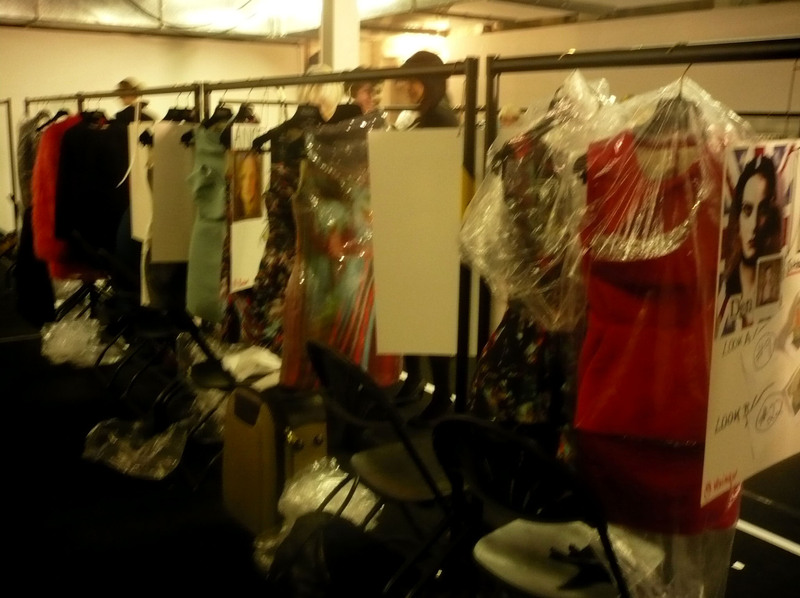 On one side were rails of dresses, wrapped in clear bags. On the other side of the room were rows of desks, each with the essential mirror-surrounded-by-lightbulbs. In the middle of the room was a table full of drinks and snack food (are the models going to eat, I wondered. Are we allowed to eat?). People were sat around so I started talking to a girl who was also dressing. A guy comes over ‘Are you dressers?’ ‘Yeah’ ‘How come you’re so early?’ ‘Are We? We were told to get here for 10’ ‘Well we won’t need you til 12’. Okay, so far so..not good. 10:00 – 11:00 - I sit around for over an hour waiting. Slowely but surely more people started arriving, the hair and makeup team walk in wheeling huge suitcases behind them. A thin girl slinks past wearing seriously high heels for 10:30 in the morning. The first model to arrived. 11:00 – By 11 the room was bustling with people stood chatting. There was a group of dressers here by now and we were all given a list of rules. ‘Do not pull the zip straight up, hold it gently and lift it inch by inch. Wear gloves if handeling a light coloured dress. Put tissue paper over the models faces to ensure that no make up gets on the dresses’. And on it went. All of us dressers were assigned a model each. 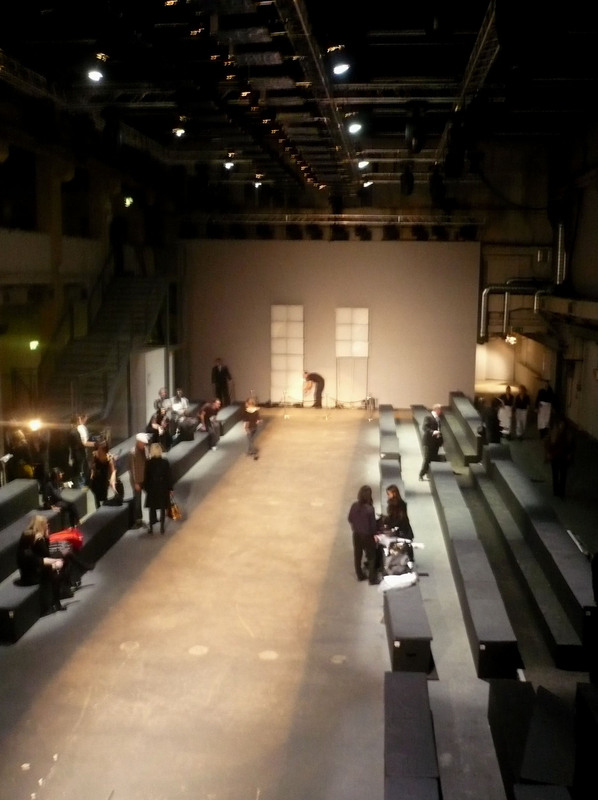 The atmosphere was relaxed considering the show was meant to start in less than two hours. The models polaroids had been glued onto big cardboard sheets so we could memorise their faces. ‘Don’t let your model out of your sight’, I was told. Where were they likely to go exactly? They were being PAID to be here whereas I was working for nothing so if anyone was likely to get fed up and walk home it would’ve been me. I say nothing and stare at my model who is sat on the floor eating an apple. I try to memorise her distinguishing features, except amongst the other models, she has none. All the models look absolutely identical. Fair skin, plump lips, dark blonde hair, big eyes, tall and skinny. Most of the models seem to have arrived and this sends the hair and makeup people into a frenzy, with up to five people working on each model at the same time. I strike up a conversation with my model, Karolin, but she is quiet and sullen. She tells me that she is tired after just having flown in from New York but is doing as many shows as possible to raise her profile. She is seventeen. 12:00 The guy in charge shouts out ‘RUN THROUGH NOW!’ and promptly forces a sticker onto my jumper which reads ‘Egle’. ‘You can be Egle’, he states. A few of the other dressers were also getting stickers with foreign names on them and I became aware that they were the names of the models that had yet to turn up. We were told we had to walk down the catwalk in their place for the run through of the show. Holy crap, I though. I have to walk down the catwalk? With the models? We were lined up in order of catwalk appearance. Infront of me stood a seven foot tall leggy beauty and behind me was another. I’ve never felt so short and rotund in all my life and im 5”9! A lady with a clipboard who is stood at the front of the line calls out each of the models names and sends them in time down the runway. Natalia, Alexandra, Irina, Maria, it was getting closer to Egle’s turn. ‘Egle, GO!’ shouted the clipboard weilding woman. I turned out of the backstage area and onto the long catwalk. The lights were so bright but I could make out the silhouettes of the people in the audience staring in my direction. The worst part was the video camera at the end of the runway which was hooked up to a huge projector in the backstage area so everyone could watch. Cringe. I walked back up the runway, a walk that can only be described as awkward. One of the models was walking down on the opposite side of the runway, swishing and strutting in her five inch platforms, with her arms casually swinging back and forth by her side. It looked so effortless. With that over with we were instructed to dress our models. Each model stood by their dresser and proceeded to undress to pretty much nothing. Bearing in mind that the models were sixteen and seventeen years old, it felt very wrong for them to be naked in this room full of strangers. I didn’t know where to look. I held out the dress for my model to step into, and stood behind her to fasten the dress, the dreaded zip. I pulled the two sides of the dress together and was shocked that they didn’t meet in he middle, this dress was tiny. I forced the two parts together and slowly managed to edge the zip upwards. ‘Its so tight’ I said without thinking, then suddenly panicked, wondering if this had offended the model. ‘Hmph, I can breathe’ She replied, unfazed. After helping her into her shoes, she was ready. 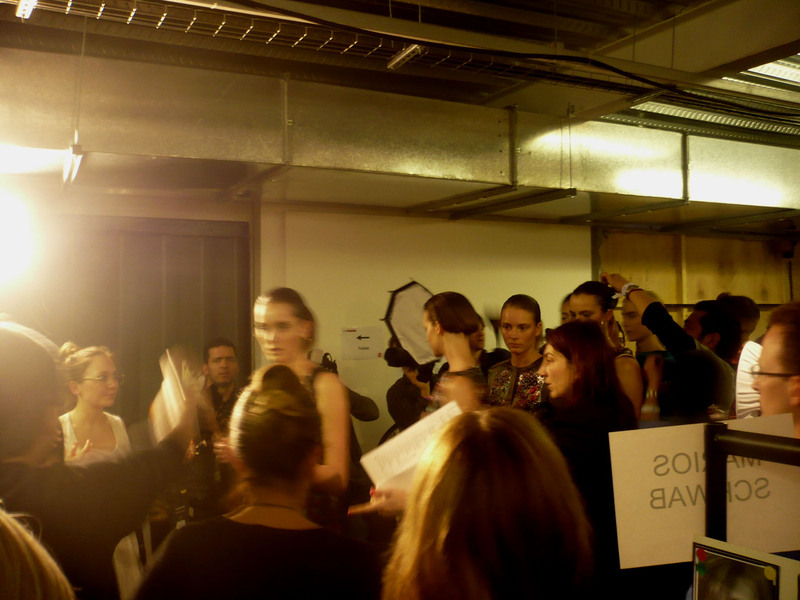 1:00 With all the models nearly dressed and showtime looming, the whole room suddenly seemed to descend into chaos. Men were shooing away the photographers and pushing them out of the way whilst the stylist was running around with pieces of jewelry. The designer was making his way round each girl checking the outfits whilst the hair and makeup team did last minute touch ups. The clipboard woman was shouting into her walkie talkie and the atmosphere became intense. This was it. Bloody hell! Even with next to no interest in fashion, I found this fascinating! Awesome write-up, very descriptive. Great review. Very informative, felt like I was there with you. Walking down the catwalk – wow – amazing.